On 25 April 1915, the Australian and New Zealand Army Corps (Anzacs) began their campaign to capture the Gallipoli Peninsula. This campaign is often considered the birth of national consciousness in both countries. It consisted of submarine incursions into the heavily mined Sea of Marmara at the entrance to the Black Sea and was the naval bombardment of the fortifications at the narrow entrance to the Sea of Marmara and the landing of ANZAC troop. The heavy losses prompted the Allies to cease any further attempts to take the straits by naval power alone. WWI was marked by large forces engaged in static trench warfare that sustained many casualties. Gallipoli was no exception. About 480,000 allied troops took part in the campaign. They endured nearly 290,000 casualties including 59,000 dead. Turkish casualties are estimated at 250,000 with 65,000 deaths. 2000 Anzacs were killed on the first day. One of the first to be killed was Private Charles Bonavia, a Maltese migrant who joined the Australian 11th Battalion in Perth. At least six other Maltese were killed in action serving with the Australians and a much higher number serving with British contingents. Australian casualties arriving in Malta from Gallipoli 1915 The number of Maltese serving with the Australian is unknown although we found that about 22 served with the Anzacs but the exact number is not known because not all records have been preserved, of the anglicising of Maltese names, and some served under assumed names. The British War Office did not allow the Maltese to raise their own battalion so they had no choice but to serve in other battalions. Piecing together all the information is difficult, but it has been established that 85 Maltese officers served in various fields with six receiving distinctions for bravery at Gallipoli. Some 650 Maltese served with the British navy and over 300 with Canadian and Australian Army contingents. ANZAC memorial at the Argotti Botanical Gardens, Floriana, Malta. In January 1915, 550 men of the Kingâ&#x20AC;&#x2122;s Own Malta Royal Militia volunteered for active duty in Cyprus, freeing the troops stationed there to join the Dardanelles campaign. The overall contribution of the Maltese can be gauged by the fact that nearly 70 per cent of males who were of military age were directly involved in the war. A little known fact about the Gallipoli campaign is the Maltese Labour Corps. This consisted of 1,000 workers under the direction of Maltese officers who unloaded ships and performed other activities at Anzac Cove. Most of the provisions for the 24,000 men in Anzac Cover came from Malta, including the water that was towed in water barges. Men of the Maltese Labour Corps worked in the leeway of a hill with enemy fire landing either short or sailing overhead into the sea. Remarkably, only one was killed and two slightly wounded. One of the injured officers was Captain Henry Curmi who later was appointed Maltaâ&#x20AC;&#x2122;s Commissioner to Australia. Malta was declared a military hospital base in early 1915 and within a short time was in a position to cater fo r 20,000 wounded ANZAC soldiers. A large number of public buildings, including schools, were converted to hospital use. In all, 27 hospitals were established. The convalescent camp at Ghajn Tuffieha, which had over 4,000 beds, was one of two tent cities catering for the wounded. The first 600 wounded arrived in Malta in May 1915 and by March of the following year it was estimated that over 60,000 wounded had been cared for. The hospitals and convalescent camps dealt with over 135,000 sick and wounded, primarily from the campaigns in Gallipoli and Salonika. This included 20,000 ANZACS. While the vast majority of ANZACS transported to Malta did recover and returned to Australia, New Zealand or to the European Front, for others Malta was their final resting place. The number of Australian deaths would have undoubtedly been higher but for the work of Maltese, British, Australian and New Zealand doctors who served with the Anzacs. Diggers in Malta ... about 55,000 troops from the Gallipoli campaign were sent to Malta to be hospitalised. Picture: Richard Ellis archive On 15 April 1916, the first Anzac Day was commemorated in Malta at the Pieta Cemetery, possibly the first Anzac ceremony in the world. At that time there were 107 Anzacs laid to rest in the cemetery. The number had increased to 204 Australians and 72 New Zealanders by the end of the campaign. It increased further as the result of WWII and today about 220 Australians are buried on the island. An ANZAC memorial was erected in 2013 at the Argotti Botanical Gardens in Floriana, Malta in honour of the 300 ANZACS who succumbed to their injuries after reaching Malta and lie buried on the island. THE NURSE OF THE MEDITERRANEAN written by Frank Scicluna. In addition, this book demonstrates the invaluable and lasting friendship that exists between the people of Australia, New Zealand and Malta formed during the Gallipoli campaign in 1915. It is a lasting tribute to our shared wartime history, the stories of those who served and the close relationship of our countries, which continues today. For further information about this commemorative publication please contact: Frank Scicluna on honconsul@live.com.au or Charles Farrugia, RSL Maltese Sub-branch President on cfarrugia@internore.on.net. Official Ceremony Pieta’ Military Cemetery at 10am. (Service is open to the public) ANZAC Concert by the Malta Philharmonic Orchestra under the direction of Mro Brian Schembri which will include in the progamme Peter Sculthrope’s piece Small Town which is a homage to the effect of war on the Australian communities (ANZAC). ANZAC Concert by the Malta Philharmonic Orchestra under the direction of Mro Christopher Muscat – pieces to the Gallipoli dead (www.maltaorchestra.com). HMS ANZAC visits Malta. Second to visit to Malta of the STS Young Endeavour at the Grand Habour. ANZAC Stained Glass at St Andrew’s Scots Church (www.saintandrewsmalta.com). Australia Botanic Garden at Argotti Gardens will display Australian plants and trees next to Malta ANZAC Memorial (Entrance is free). 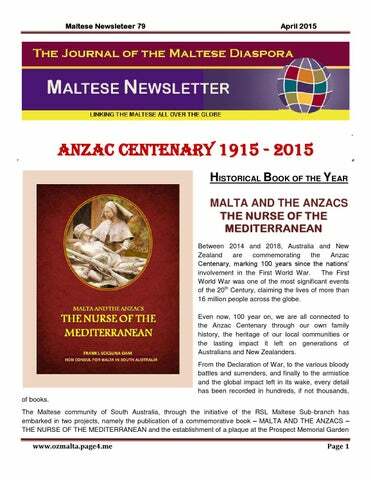 THE COMMEMORATIVE BOOK – MALTA, THE NURSE OF THE MEDITERRANEAN CONTAINS 150 PAGES, PICTURES IN COLOUR AND GLOSSY THROGHOUT. BECAUSE OF THE COST, WE PRINTED ONLY A LIMITED NUMBER, THEREFORE RESERVE A COPY TODAY. THE PRINTERS WILL BE SENDING THE BOOKS IN THE NEXT TWO WEEKS FROM OVERSEAS. 10 facts about the ANZACs 10 quick facts about the "boys at the front". How much do you really know about the ANZACS? 1. ANZAC is an abbreviation of The Australian and New Zealand Army Corps. 2. April 25, 1915, was the day the ANZACs landed on the Gallipoli Peninsula, now known as ANZAC Cove (see photo above) to battle the Turkish army during WWI. Gallipoli campaign, the Australian Government is hoping to gain financial support to bring the military hall back to its glory. It was built as an entertainment and recreation hall for convalescing Aussie and Kiwi troops in November 1915. Part of our story ... ANZAC soldiers recover in the Cottonera Hospital during WW1. Picture: Richard Ellis archive Source: Supplied Walking wounded ... 58,000 Anzacs from the Gallipoli campaign were taken to Malta for treatment. Picture: Courtesy of Malta's Heritage. Source: Supplied The hall, built for the 1915 Gallipoli campaign, survived military service in WW2 but is today a shell of its former self with no roof, a suspicious gutting fire and developers now circling its prime location on the corner of ANZAC Street and Alamein Street on the northern coastal tip of Malta. A spot of respite ... servicemen enjoy a dance at Australia Hall. Picture: Richard Ellis / Archive Malta Source: Supplied This year, on the centenary of the Gallipoli campaign, the Australian Government is hoping to gain financial support to bring the military hall back to its glory. It was built as an entertainment and recreation hall for convalescing Aussie and Kiwi troops in November 1915. The hall and extensive gardens, then surrounded by a number of field hospitals and their barracks, was built for the men as they recovered and could be returned to the frontline. The chiselled distinctive Australian Coat of Arms is still there, as is a stone declaration it was built on donations from the public believed to be predominantly from NSW. Maltese biometric passport The Maltese passport is a European Union passport that is issued to Maltese citizens. Every Maltese citizen is also a citizen of the European Union. The passport, along with the national identity card allows for free rights of movement and residence in any of the states of the European Union and European Economic Area. According to the Henley Visa Restrictions Index 2014, Maltese citizens can visit 166 countries without a visa or with a visa granted on arrival. Maltese citizens can live and work in any country within the EU as a result of the right of free movement and residence granted in Article 21 of the EU Treaty. A biometric passport, also known as an e-passport, ePassport or a digital passport is a combined paper and electronic passport that contains biometric information that can be used to authenticate the identity of travelers. It uses contactless smart card technology, including a microprocessor chip (computer chip) and antenna (for both power to the chip and communication) embedded in the front or back cover, or center page, of the passport. Document and chip characteristics are documented in the International Civil Aviation Organization's (ICAO) Doc 9303. The passport's critical information is both printed on the data page of the passport and stored in the chip. Public Key Infrastructure (PKI) is used to authenticate the data stored electronically in the passport chip making it expensive and difficult to forge when all security mechanisms are fully and correctly implemented. The currently standardized biometrics used for this type of identification system are facial recognition, fingerprint recognition, and iris recognition. These were adopted after assessment of several different kinds of biometrics including retinal scan. The ICAO defines the biometric file formats and communication protocols to be used in passports. Only the digital image (usually in JPEG or JPEG2000 format) of each biometric feature is actually stored in the chip. The comparison of biometric features is performed outside the passport chip by electronic border control systems (e-borders). To store biometric data on the contactless chip, it includes a minimum of 32 kilobytes of EEPROM storage memory, and runs on an interface in accordance with the ISO/IEC 14443 international standard, amongst others. These standards intend interoperability between different countries and different manufacturers of passport books. N.B. All Maltese citizens living in the continent of Australia and New Zealand must travel to Canberra, Sydney or Melbourne to obtain a biometric Maltese passport. To fly and accommodation are very expensive and inconvenient especially if you are travelling with a family, if you are handicapped or a pensioner or if you have to take time off work. This unresolved issue has been going on since 2008 â&#x20AC;&#x201C; believe it or not!!!! Renewing or Replacing a Lost/Stolen Passport in Malta RENEWING A PASSPORT IN MALTA – OVER 18 Adult passports expire every 10 years. If your passport has expired, you will need to apply for a new passport before you can travel again. If you are over 18, you will need to start your application process by filling in Form A, paying particular attention to the dates of birth requested. It does not need to be signed by a recommender. To complete your application, hand in the form at the Passport Office, along with your ID Card and current passport. A facial biometric image, signature and your fingerprints will be taken. The relevant fee will also have to be paid, by cheque, cash or card. Provided that your application is correct, your passport will then be ready after four working days. RENEWING A PASSPORT IN MALTA – UNDER 18 Be sure to check that your child’s passport has not expired before you plan to travel. If you are under 18 (or are applying for a passport on behalf of a minor), you will need to fill in Form A, paying particular attention to the dates of birth requested, and to Sections 7 and 8, which need to be completed and RENEWING A PASSPORT IN MALTA – UNDER 18 Be sure to check that your child’s passport has not expired before you plan to travel. If you are under 18 (or are applying for a passport on behalf of a minor), you will need to fill in Form A, paying particular attention to the dates of birth requested, and to Sections 7 and 8, which need to be completed and signed by a recommender. Minors aged between 16 and 17 years will need to renew their passport every 10 years, while those between 10 and 15 will need a new one every five years, and those under 10 every two years. To complete your application, hand in the form at the Passport Office, along with both parents’ Identity Cards, two recent identical and coloured photographs of the minor taken against a white background (one of which should be signed by the recommender), and the previous passport, if any. If your child is over 14 years of age and holds a valid ID Card, you do not need to produce any signed photos. A facial biometric image will be taken at Passport Office. However applicants over 14 years must present their Identity Card when submitting the application. If your child is aged 12 years and over, he/she will also have his/her fingerprints taken upon application. Provided that your application is correct, your passport will usually be ready after four working days. Both parents’ ID Cards will be required when applying for the new passport. One of the parents would need to come in person (with his/her ID Card) to collect the child’s passport. All applicants aged 12 years and over must call in person to collect their passport (minors must also be accompanied by at least one of their parents). CHANGING PASSPORT DETAILS To change the details on your passport, you will need to have a new passport issued. For details on this, please follow the ‘renewal’ details above. HAS YOUR PASSPORT BEEN LOST OR STOLEN IN MALTA? If your passport has been lost, stolen or destroyed in Malta, it is vital that you report the occurrence at the nearest Police Station. You will then need the relevant Police Report when applying for a new passport, and will also need to make a Solemn Declaration. You will then need to apply for a new passport, following the instructions here. LEGGENDA TA’ L-ANZACS U MALTA L-EWWEL GWERRA DINJIJA 1915-2015 (In Maltese) Kull sena – fil 25 t’April – l-Awstralja, New Zealand, Malta u hafna pajjizi ohra jikkomemoraw JUM l-ANZAC, lanniversarju mindu suldati Awstraljani u minn New Zealand inqatlu bl-eluf fil-battalja ta’ Gallipoli fit-Turkija fil-1915. Ittruppi Inglizi, Awstraljani, Francizi u dawk ta’ New Zealand fil-ghodwa tal-25 t’April illandjaw fil-bajja ta’ Gallipoli u l-bicca kbira minnhom jew gew maqtula jew midruba mis-suldati torok li kienu fuq il-quccata tal-gholja quddiem il-kosta. Malta hadet sehem f’din t-tragedja ghax hija serviet ta’ kenn u ghajnuna ghal dawk is-suldati li ndarbu gewwa Gallipoli. Minn kważi 58,000 suldat li ndarab jew li marad fil-kampanja tad-Dardanelli, eluf ta’ suldati Awstraljani u minn New Zealand kienu evakwati lejn Malta għall-kura medika. U b’hekk l-istorja tfakkar li Malta giet imlaqqma bħala ‘In-ners talMediterran’. Madwar 229 Awstraljan u 79 suldat minn New Zealand, spiċċaw biex mietu u ndifnu f’oqbra fil-gzira ckejkna Maltija. Ic-cimiterji li fihom jinsabu l-fdalijiet ta dawn is-suldati Awstraljani U MINN New Zealnd huma cCimiterju tal-Addolorata gor-Rahal Gdid, ic-Cimiterju tal-Pieta’ u c-Cimiterju tal-Kappucini filFurjana. Kien l-ewwel Malti li gie maqtul flimkien l-ANZACS f’Gallipoli - Charles Bonvaia. Huwa twieled ilBelt Valletta fis-sena 1888. Missieru, Emmanuel, kien registrar fil-Qorti ta’ Malta u n-nannu tieghu, Tumas, sahansitra spicca biex sar Kurunell tar-Royal Malta Fencible Aliterry. Charles Bonavia kien gie iggradwat bhala perit mill-Universita’ ta’ Malta qabel ma emigra ghallAwstralja fl-1911. Bonavia ingagga fil-11th Battalion 3rd Infantry Brigade u minn Fremantle salpa ghall-Egittu fil-1914 biex ma shabu suldati l-Awstralhani jitqabdu fil-battalja kontra l-ghadu eluf ta mili l-boghod fit-Turkija. cimiterju ta’ Lone Pine fejn hemm midfunin 986 ruh – 471 suldati Awstraljani, 2 minn New Zealand 14 Inglizi u 499 suldati ohra midfunin go qobra minghajr isem. Malti iehor li li ismu jibqa mnizzel fil-Helles Memorial fuq ix-xaqliba ta’ Dardanelles huwa dak tal-Maggur Herbert Sammut li waqt waqt il-battalja fuq dik l-inhawi tad-dinja halla hajtu u ismu huwa wkoll mnaqqx fil-monument tal-Gwerra gewwa Canberra, l-Awstralja. Fil-peninsula ta’ Gallipoli hemm 31 cimiterju li fihom hemm 22,000 oqbra. Il-fdalijiet ta’ 9000 suldat gew misjuba imma 13 000 minhhom qatt ma nstabu. Hafna emigranti Maltin li gew l-Awstralja fil-bidu tas-seklu ghoxrin kienu uhud mill-midrubin go Gallipoli. Kien hemm iktar minn 800 haddiema li kienu taht il-kmand ta ufficjali Maltin. Suldat ta’ 27 sena, Giuseppe Camilleri, kien wiehed li halla hajtu f’Gallipoli u gie midfun vicin il-bajja hdejn ic-cimterju ta’ Ari Barnu vicin ANZAC COVE. ( 9 Qabar numru 4, filliera J). Kull sena, proprju fil-25 t’April gewwa fil-gzira ta’ Malta ssir cerimonja ghad unur tal-ANZAC quddiem il-Monument talGwerra l-Belt Valletta u ic-cimtrju ta’ Braxia, Pieta. Ghaliha jattendu l-President u l-Prim Miinistru ta’ Malta, Il-Kap talOppozizzjoni, il-kummissarju Gholi Awstraljan u bosta dinjitarji ohra li jpoggi l-kuruni f’riglejn il-monument.Kienet aħbar sabiħa meta sirna nafu li l-monument tal-ANZAC li Kumitat tal-Malta Anzac Memorial, that ic-chairmanship tas-Sur Nicholas Bonello, waslu biex jibnu monument li jikkomemora ANZACS li mietu u gew midfunin f’Malta. Dan il-monument li gie mtella fil-gnien tal-Argotti, il-Furjana għandu jsaħħaħ sewwa il-ħbiberija bejn Malta u l-Awstralja. L-istorja tfakkarna flewwel gwerra dinjija meta Malta saret l-isptar tal- Mediterrani u kif is-suldati tal-allejati kienu jispiċċaw Malta għal kura u mistrieħ qabel ma jirritornaw lura lejn il-battalja jew pajjizhom. Ghal din l-okkazjoni il-Fergha Maltija tal-RSL tas-South Australia hadet inizjattiva u talbet il-Gvern Awstraljan biex jissusidja z-zewg progetti taghhom, L-ewwel progett huwa biex plakka fil-gnejna botanika ta’ Prospect bl-ismijiet ta 18-il sudat mis-South Australia li huma midfunin f’Malta. It-tieni progett huwa ktieb kommemorattiv bit-titlu ta’ MALTA – THE NURSE OF THE MEDITERRANEAN li gie miktub minn Frank Scicluna. Dan il-ktieb li fieh 150 pagna huwa bil-kulur u fieh ritratti, documenti u l-ismijiet kollha tas-suldati Awstraljani u minn New Zealand li huma midfunin gewwa c-cimiterji ta’ Malta, kif ukoll l-ismijiet tal-isptarijiet u c-cimiterji f’Malta li ghandhom x’jaqsmu mal-ANZACS u l-Ewwel Gwerra Dinjija. KTIEB LI GHANDU JSEBBAH IL-LIBRERIJA TIEGHEK. Akkwista ktieb ghalik u ghall-uliedek – ikkuntatjani. April 2015 Għaliex Kristu l-Bniedem Alla Kien ifejjaq lil kulħadd – Għalih mhemmx razez, fruntieri, Qatt ma ħares lejn wiċċ ħadd. Kristu Rxoxt hu l-Missier twajjeb Mis-salib fetaħ idejh Għaliex ried meta jitgħolla Lilna jiġbed ilkoll lejh. U għalhekk f’dan l-Għid Imqaddes Nitolbuk Mulej Ġesu’ Irxuxtana mill-mewt tagħna Imla ‘l qalbna b’kull virtu’. Lill-Maltin u ‘l-Għawdxin kollha Imla ‘l qalbhom b’ferħ ġenwin Li Gesu’ bil-qawmien tiegħu Feda lilna l-bnedmin! St Thomas Bay in Marsascala In the outskirts of Marsascala, one finds a large, natural inlet with small sandy banks and shallow water suitable for bathing. This is St Thomas Bay, known as 'Ir-Ramla' to the locals. St.Thomas Bay is on the outskirts of Marsascala. In fact it's very close to the village of Zejtun. The bay is very large; however it only has a small sandy beach. Cliffs surround the majority of the bay. Its shallow waters and small sandy banks make the bay suitable for bathing especially for children. It is also popular with local holidaymakers. The bay is ideal for windsurfing. Now with the official opening of the new bypass Marsascala has become more accessible to all. Only a ten minute walk from the main southern resort of Marsascala, this somewhat large and natural inlet is quite popular with local holidaymakers. This secluded bay in the south of Malta has not yet been developed into a tourist area and has more of a Maltese vibe with plenty of families enjoying its rocky coastline and small sandy banks. Its shallow waters and sandy beach make it suitable for both sunbathing and swimming. For those who are more adventurous, it is also possible to hike to the Munxar cliffs which offer stunning views of the white cliffs as well as the opportunity to swim in some of the clearest waters. Sea urchins can be found in abundance here and it is also possible to see locals snorkeling in the area collecting them for a local favourite Mediterranean pasta dish. The seafront is a wonderful place for a stroll. You will also without doubt meet local fisherman bringing in fresh fish. Only a few minutes away, you can enjoy a pleasant walk on the Marsascala promenade where most restaurants offer dishes of fresh Maltese fish at reasonable prices. St. Thomas’ Tower and a number of rural chapels are also worth a visit. REMEMBERING FATHER JOSEPH BRIFFA The Maltese community in Melbourne, Australia is mourning the passing away of Fr Joseph Briffa, affectionately known as Fr Joe, and a prominent member of the Maltese clergy in Melbourne. He passed away on Wednesday 4 March 2015 at St Vincent’s Hospital, Melbourne, aged 85 years.In a circular letter announcing Fr Briffa’s passing away, Monsignor Greg Bennet Vicar General of the Archdiocese of Melbourne outlined the many achievements in his religious life. The following is reproduced from the Vicar General’s letter: Fr Briffa was born in Birkirkara, Malta, on 16 December 1929. Following his primary and secondary education, he entered the National Seminary in Malta in 1951. In December 1952 he chose to go to India with Fr Mizzi OFM Cap commencing his studies in philosophy in 1952 at St Joseph’s Allahabad. Upon completion of his philosophical studies, he enjoyed an experience working in Mission stations. In 1955 he entered St Albert’s College Ranehi in Bihar State for his studies in theology. On 3 December 1958 he was ordained at St Joseph’s Cahedral in Bankipur in the Diocese of Patna, India. He was appointed to various Mission stations and parishes. Among his many works was the establishment of a credit union to assist his people from the hands of money lenders. He enjoyed his missionary work often among the most marginalised people. Fr Joe was a gifted linguist; Latin, Hindi, Santhali and Buchpuri among some of the languages he learned with great flair. In 1962 he volunteered to work among the people on the border between India and Bangladesh. He was appointed Dean of the Cathedral in the Diocese of Patna. The missionary zeal captured Fr Joe. It was through Bishop Wildermuth, who was friendly with Archbishop Knox, who had previously been Nuncio to India, that the opportunity to come to Melbourne opened. Coming to Melbourne on 12 October 1971, Fr Joe had arrived at his final destination. He had no aspirations of being a Parish Priest, so was pleased to be appointed Assistant Priest in Ascot Vale (1971), Hadfield (1974), Hastings (1976), Parkville (1978), Newport (1984), Thomastown West (1986), Carlton as Chaplain to Royal Melbourne and Royal Womens’ Hospitals, Altona North (1989), Hoppers Crossing (1994) and his final appointment at Good Shepherd, Gladstone Park. Retiring in 2002 as Pastor Emeritus, Fr Briffa enjoyed his time at George Maher House, Justin Villa and, more recently, at St Catherine’s, Balwyn. He lived a simple life, enjoying the opportunity for prayer and reflection, creating his model churches and the company of others. Fr Briffa was a kind and generous priest. Many of his acts of kindness would be known to few. He gave and never asked for anything in return. He was humble in his service of the God he loved and wished to serve with such devotion. His story of life and priesthood was one of adventure. In leaving the shores of Malta in 1951 that he dared to embark on a life of missionary service which blessed the lives of so many people. In coming to Melbourne, he became a brother priest to us. He appreciated very much the friendships which he forged. In recent years he contemplated the journey of his life, and reflected the words of T. S. Elliott, “We shall not cease from exploration, and the end of all our exploring will be to arrive where the journey started and know the place for the first time.” The journey is complete, his exploration is over, may Fr Joe know of the eternal love of God who accompanied him throughout his life. o A most stunning natural swimming pool in Malta, St. Peter’s Pool is closely located to Marsaxlokk at the tip of Delimara Point in the south west of Malta. St. Peter’s Pool is not the easiest place to find but it is on the way to Marsaxlokk Bay. Located in a small bay on the Delimara peninsula, St. Peter’s Pool is just off the tall chimney tower next to Marsaxlokk Bay. Crystal clear with a beautiful azure and light green colour, this area offers plenty of opportunities for snorkeling. The flat rocks around the pool provide the ideal opportunity for sunbathing while the high rocks will shield you from the strong sun rays. Ladders are available for access to the sea but there is also the added option of diving into the waters for the more adventurous bathers. St. Peter’s Pool is highly popular with the locals living in the nearby villages as well as for tourists looking for a more remote location to spend their day. Due to its secluded position, it is rarely crowded and you can easily find a spot for yourself. Just make sure to bring whatever you need for your day out as there are no facilities available. This natural swimming pool may not be suitable for small children at times when it is windy. May 2015 Maritime History Immigration and Migration Collection Western Australian Maritime History Immigration Museum White immigration sign, inscribed: 'HAWNEKK NITKELLMU BIL-MALTI', with word 'BIL-MALTI' in larger red text. Red and white Maltese flag in upper right hand corner of sign. Translation: 'Maltese Is Spoken Here'. The colours of the flag are unfortunately reversed. David Plowman, champion of Maltese child migrants. (1942 – 2013) David Plowman made important contributions to industrial relations scholarship, management education and the cause of Maltese child migrants in Australia. From 2002, through to its disbanding in 2009, he was chairman of the Child Migrants of Malta organisation, raising awareness of Maltese child migrants and lobbying on their behalf concerning their past treatment. In 2012, he was made a Member of the Order of Australia for this work. David Henry Plowman was born on April 9, 1942 at the Intafa Military Hospital in Malta, the second of three sons to Harold Plowman, an English soldier who had married a Maltese woman, Josephine Cassar. After the war the family moved to England, but because David and his brother Jim had respiratory problems it was decided that Josephine and the boys would return to Malta. Although Harold was supposed to join the family, he never appeared. Jim concluded that there was no future for them in Malta and persuaded David that they should move to Australia as child migrants. They did not travel together as David suffered an injury and needed to recover before he could travel, so Jim arrived in Fremantle in 1953 and David joined him three months later. They were two of 310 Maltese child migrants who found their way to Australia between 1950 and 1965. Eight years later, David and Jim sponsored Josephine and younger brother Richard to join them. After David arrived in Australia he was moved to Tardun, 480 kilometres north of Perth, and attended St Mary’s Agricultural College. He maintained contact with the school all his life and in 2003 published a history of the school, Enduring Struggle: St Mary’s Tardun Farm School, celebrating its 75th anniversary. After St Mary’s, Plowman went to teachers’ college and won a scholarship for a Master of Arts in Industrial Relations at the University of Melbourne. In 1973, he married Catherine Burke after meeting her at a church social club. At the end of the 1970s, Plowman was employed in the Department of Industrial Relations at the University of NSW. In time, he became a professor of industrial relations and was appointed head of the School of Industrial Relations and Organisational Behaviour. In 1993, he went back to Western Australia as the director of the Graduate School of Management (now called the Business School) at the University of WA. He had a broad, generalist approach to industrial relations research. He published several books and many articles that examined both historical and contemporary issues. The breadth of his research is indicated by the titles of his books: Australian Industrial Relations (1980) (the first textbook in the area, co-authored with a variety of other scholars over many editions), Australian Trade Union Statistics (1981), Wage Indexation: A Study of Australian Wage Issues (1981), Australian Unions: An Industrial Relations Perspective (1983) (a co-edited book of readings), Holding The Line: Compulsory Arbitration and National Employer Co-ordination in Australia (1989) (based on his PhD thesis), Australian Industrial Relations: An Introduction (1992) and Australian Wage Determination: Select Documents (1992). In 1994, Plowman was elected a fellow of the Academy of the Social Sciences in Australia. In late 2013, Plowman received the University of WA Chancellor’s Medal and the Dean’s Award from the Business School of the University of WA. He was also the founding editor of The Economic and Labour Relations Review, which has now run for 25 years. Plowman approached life with enthusiasm and energy. He was an energetic and hard-working scholar, and an able and forthright administrator. His approach to everyone was simple, genuine and courteous. He liked helping others and was never happier than when one of his students reported back to him about their progress. Even as he approached death, all he wanted to do was to hear news, talk and laugh about old times from visitors, saying nothing about himself. He was one of life’s gentlemen. I AM ATTENDING THE CONVENTION 2015 AND THE MEETING OF THE COUNCIL OF MALTESE LIVING ABROAD IN MALTA LATER THIS MONTH, THE NEWSLETTER WILL NOT BE PUBLISHED. WE WILL BE BACK TOWARDS THE END OF MAY. State of Nibbia chapel ruins – Chapel of Bones Valletta It was good to learn that the shamefully desecrated Spencer’s Tomb is being restored as part of the House of Four Winds project and that St Roque’s chapel on St Michael’s Counterguard is being rebuilt. These works will see the reinstatement of two little-known historic landmarks in Valletta.Can the authorities extend their good work by also seeing to the remains of the Nibbia chapel, which sit in the parking lot of the Evans Building? The fence that surrounds the site has been almost totally destroyed while the once sacred area within has become a dumping ground. The remains of the Nibbia chapel today and a photograph taken soon after the building was bombed during the last war Besides being an embarrassing eyesore, particularly since hundreds of tourists pass by here each day, this site is of significant historical value. The few precious masonry remains, including the sarcophagus in which the Italian knight Fra Giorgio Nibbia (1555-1619) was laid to rest, are rapidly decaying as a result of exposure to the elements and neglect. Attributed to architect Romano Carapecchia, this was an unusual chapel in both design and use. It replaced an earlier one which, in 1730, had to be demolished to make way for an extension of the nearby women’s hospital. Below the remains, a sizable crypt is known to exist. Dedicated to Our Lady of Mercy, the new chapel stood next to the cemetery in which countless individuals were buried after succumbing to illness or injury at the adjacent Sacra Infermeria. In fact, the chapel was known as Taz-Zuntier (an old Maltese word for cemetery). During the last war, the Nibbia chapel was damaged (although not heavily) and, in the late 1970s, it was inexplicably demolished, leaving the stumped ruins we see today, ruins that are now obscured by rubbish and vegetation. Following a thorough clean-up and consolidation of the ruins, an idea would be to install a reversible shading device to protect the fragile remains and turn the site into a quiet meditation space just as had been done with a number of blitzed sacred buildings in the City of London such as Christ Church Greyfriars. A similar exercise has been carried out by the Restoration Unit in Siġġiewi where the old parish church ruins have been expertly preserved and successfully turned into an archaeological attraction. Incidentally, could the sign erroneously stating “Chapel of Bones” be removed and replaced with a correct information panel? Judge Giovanni Bonello has carried out extensive research and written about the Nibbia chapel. A little known fact is that the actual Chapel of Bones lies underground further towards the Evans Building and, hopefully, one day will be rediscovered, revealing yet another lost, historic landmark of our splendid capital city. The Chapel of Bones was a very interesting spectacle. The bones of the soldiers killed during the war with the French at the time of Napoleon had been unearthed and arranged in artistic form all over the walls and ceiling of the chapel. On one side were preserved whole the skeleton of the French leader, and opposite was that of a Maltese lady who built a hospital. On a low shelf were a row of five skulls with large bullet holes in their foreheads. They were Maltese civilians shot by the French.